I used the leftover roasted cranberries for breakfast the next two days spreading brie or cream cheese on whole wheat toast and topping it with the cranberries. Yum! I’m finding when a mix of ingredients sounds ‘interesting’ it usually results in something you expect to be good turning out to be unexpectedly great! 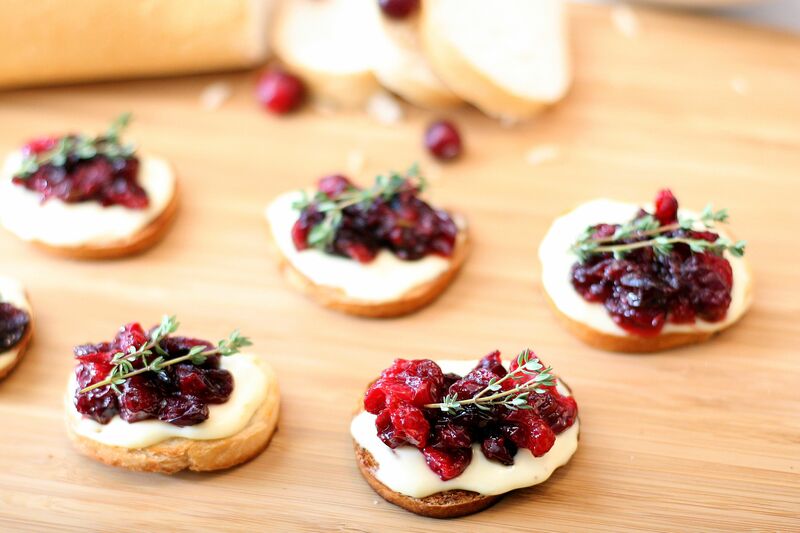 For the Roasted Cranberry and Brie Crostini, you’ll toss cranberries with sugar, balsamic vinegar and rosemary to make a topping with all kinds of good flavor. 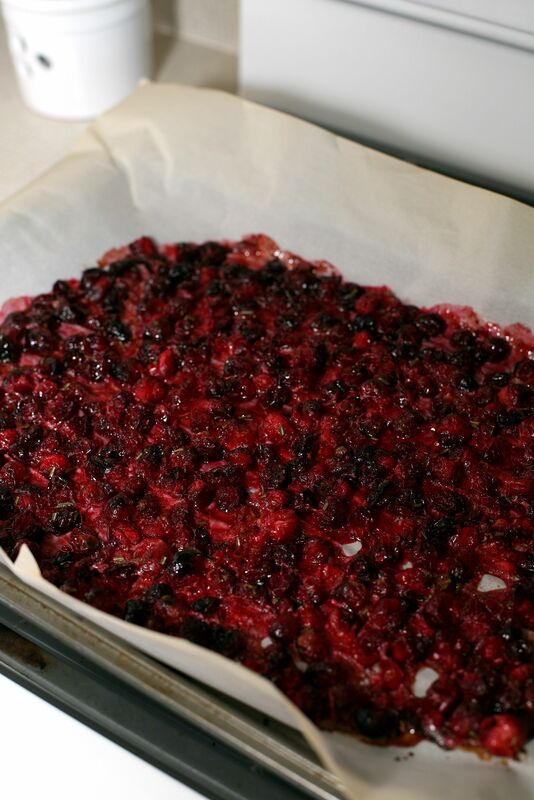 Once the cranberry mixture is tossed, you’ll spread it on a rimmed baking sheet covered with parchment paper. It can get a little sticky when baking so the parchment paper is going to simplify cleanup significantly. Parchment paper is one of my best friends when baking! You’ll also want your bread prepped at this point – a fresh french baguette sliced thinly, brushed lightly with olive oil/butter and lined up on a separate baking sheet. You’ll roast the cranberries for about 8 minutes and then add the baguette slices to the oven. After 5 minutes, flip the bread over and return to the oven for another 4-6 minutes until crisp and lightly golden. Keep an eye on the oven at this point, because some of my baguette slices got a nice dark brown tan! By now the cranberries should be popped with juice running out and that will be your answer to the question “are they done?” Once you remove everything from the oven you’re ready to assemble. 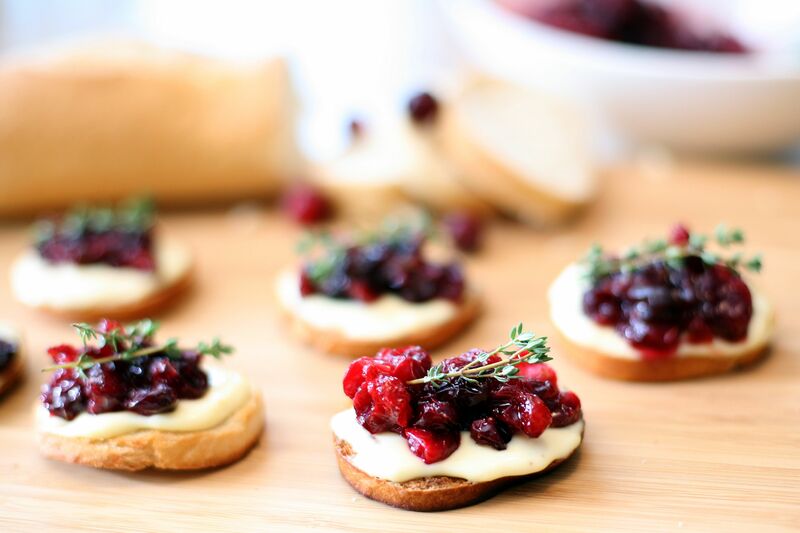 Top the baguette slices with brie, carefully add a spoonful of roasted cranberries and if you’re feeling festive garnish with a sprig of thyme! These make a beautiful appetizer for Thanksgiving, holiday parties and Christmas. It’s a good way to impress guests with little effort! Roasted Cranberry and Brie Crostini may easily be named my favorite holiday appetizer of 2016. I suppose the official announcement will be in January; I have plenty of time to continue ‘Pinteresting’ between now and then 🙂 See below for the recipe. Tis’ the season! In a small bowl, combine butter and olive oil. Lightly brush each side of the baguette slices with the olive oil/butter and line up on a parchment paper covered baking sheet. Set aside. 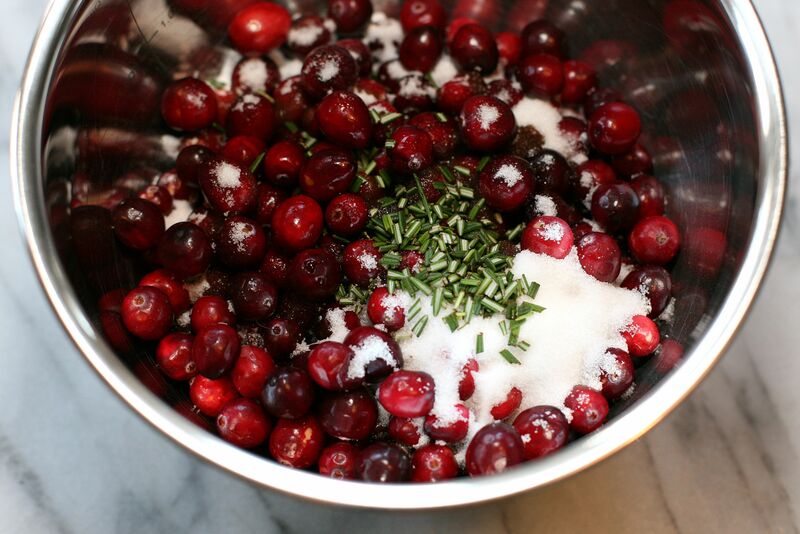 In a medium size mixing bowl, gently toss the cranberries, sugar, balsamic vinegar and rosemary until mixed well. Spread the mixture on a rimmed baking sheet lined with parchment paper. Place the cranberries in the oven and roast for 8 minutes. Add the baguette slices to the oven with the cranberries and roast for another 5 minutes. Flip the baguette slices and return to the oven (cranberries still roasting) for another 4-6 minutes. Watch closely to avoid burning. Once the baguette slices are crisp and golden and the cranberries have popped allowing the juices to run over, remove both from the oven. Top each baguette slice with brie and a spoonful of cranberries. Garnish with thyme if feeling festive. *The roasted cranberries can be chilled prior to use. If making ahead of time, store the cranberries in an airtight container in the refrigerator and the bread wrapped in foil in a Ziploc bag until ready to assemble and serve.